This service pack is now available to Subscription Service customers. To download, click here or log into the SOLIDWORKS Customer Portal at https://customerportal.SOLIDWORKS.com and click Download Software and Updates to get access to the update. Make sure you’re registered for Early Visibility Program* to get access and notified for early visibility releases. For registering for Early Visibility Program*, log into your SOLIDWORKS Portal account, go to my profile and select the option “Notify me for EV (Early Visibility) access” under My Preferences. *P.S: Login required for access. Full access requires an active Subscription Service contract. – Performance reporting is turned on for EV releases. – The full version is scheduled 3-4 weeks after the EV version and is subject to change without notice. This entry was posted in General, My.SolidWorks, News, Service Pack, Solidworks, SW2016, What's New and tagged Classic Icons, Classic Theme, Early Visibility, EV, Installation, service pack, Service_Pack, solidworks, SOLIDWORKS 2016, SP, SP update, SP-5-0-ev, SP5.0_EV, SW16, SW2016, Ui Improvements, Updates on September 29, 2016 by Deepak Gupta. As stated by Tom Spine, code changes for SOLIDWORKS 2016 SP02 were locked down at the end of December and SP2 EV (Early Visibility) is planned for next week as we finish up final stability testing. SP2 contains over 200 customer-driven and stability fixes, so we need to stay on schedule with that as we continue to work on your important UI concerns.. Text contrast in the FeatureManager design tree. Other fixes: About 25 fixes for issues related to the user interface brightness settings, most about problems with the Dark theme. For registering for Early Visibility Program, log into your SOLIDWORKS Portal account, go to my profile and select the option “Notify me for EV (Early Visibility) access” under My Preferences. This entry was posted in My.SolidWorks, News, Service Pack, Solidworks, SW2016 and tagged Early Visibility, EV, Installation, Mat Icons Fixed, service pack, Service_Pack, solidworks, SOLIDWORKS 2016, SP, SP update, SP2.0_EV, SW16, SW2016, Ui Improvements, Update on January 22, 2016 by Deepak Gupta. This entry was posted in My.SolidWorks, News, Solidworks, SW2016 and tagged Early Visibility, EV, Installation, service pack, Service_Pack, solidworks, SOLIDWORKS 2016, SP, SP update, SP1.0_EV, SW16, SW2016, Update on November 29, 2015 by Deepak Gupta. SOLIDWORKS 2016 gives you a new option to move the Confirmation Corner option next to pointer. The existing method of pressing RMB or right click and select OK from the pop up window still works. But in some cases where you need to click the OK or Cancel button from right top corner or feature manager, can now be brought to near to pointer using the shortcut key “D”. This option works with Part, Assembly and Drawings as well. The shortcut key can be changed to any other key. This entry was posted in Assembly, Drawing, Part, Solidworks, SW2016, Tips n Trick, What's New and tagged 2016, Assembly, Confirmation Corner, D Key, Drawing, Enhancements, New Features, part, solidworks, SOLIDWORKS 2016 on October 26, 2015 by Deepak Gupta. We all use Scale feature in the model to quickly scale up or down a model. The idea is to quickly change the geometry of the model for various purpose. For e.g. in a plastic mold, components are usually scaled up to take care of shrinkage. The scale value depends on the plastic material. It does not scale dimensions, sketches, or reference geometry but only the model geometry (body). One can scale a solid or surface body about its centroid, the model origin, or a coordinate system depending on the requirements. 1. Open the model you want to apply scale to. 2. Go to Insert > Feature > Scale OR use Scale icon from the toolbar. 4. Fill in the required value and click OK.
5. Scale feature is added to the model. You can scale selected bodies in case of a multi body part. You can also scale with different values of X, Y and Z directions by deselecting uniform scaling and adding required values for X, Y and Z directions. Now if you have various configurations, you can easily control the scale factor value for them using two simple methods. 4. Choose uniform scale or uncheck it. 5. Key in the desired scale value. 6. If you have more than one configuration in the model, then you would see another box for the configuration selection. Select the desired option and configuration accordingly. 7. Click OK and Scale feature is added to the model. 1. Open the Model having the configurations. 3. If you already have a scale feature then it should get added to the design table. If not then add the column headers for controlling the scale feature. 4. In case you want to keep the uniform scale, add column header as $X_AXIS@Scale Feature Name and desired value for each config. 5. In case you want different values for X, Y and Z directions, then add three column headers as $X_AXIS@Scale Feature Name, $Y_AXIS@Scale Feature Name, $Z_AXIS@Scale Feature Name and desired value for each config. 6. Exist the design table and your scale feature in now controlled via design table. This entry was posted in PDF Creator, Solidworks, Tables, Tips n Trick and tagged Configurations, Design Table, part, Scale Feature, solidworks on July 1, 2015 by Deepak Gupta. 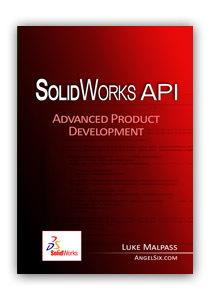 CADSharp is happy to announce the second SOLIDWORKS API programming contest! The problem is simple and you need to write the codes to achieve the desired results. Hurry up to submit your codes before July 1, 12:00AM EST. 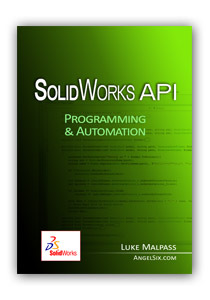 Three winners will be chosen based on the number of lines of code in their macro. First prize: $100 gift card at Amazon.com. Second prize: $50 gift card at Amazon.com. Third prize: $50 gift card at Amazon.com. Note: The Amazon gift cards can only be awarded to entrants who may purchase Amazon.com or one of its affiliates in Australia, Canada, United Kingdom, Germany, Italy, France, Spain, Netherlands, China, Brazil, India, Mexico, and Japan. Otherwise, a 2-month Power User membership (valued at $199) will be awarded instead. Optionally, a winner that is entitled to a gift card may choose to receive the 2-month CADSharp Power User membership instead. 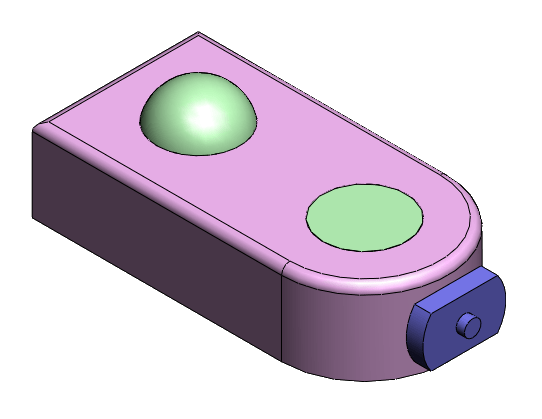 This entry was posted in CADSharp, Solidworks, SOLIDWORKS Macro and tagged API, CADSharp, Contest, Macro, Programming, solidworks, SolidWorks VBA, VBA on June 22, 2015 by Deepak Gupta.